If something suspicious is happening, you can fire off an alarm, alert the police or even shout at the intruder straight through the camera, all while recording their every move. 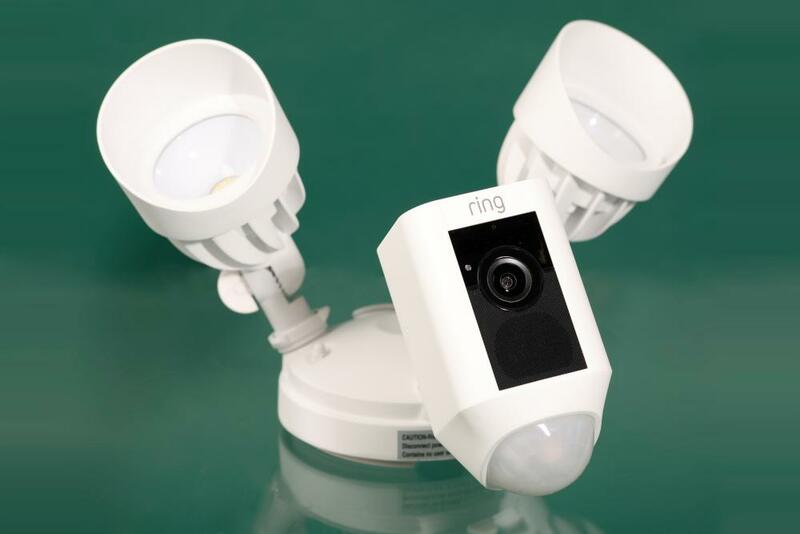 The Ring Floodlight Cam combines, as the name might suggest, two articulated LED floodlights and a camera in one device, which make it perfect for replacement of traditional security lights in the back garden. Larger and more capable than its battery-driven siblings, the Floodlight Cam comes in black or white but requires wiring into the mains, most probably by an electrician. Once that hurdle is overcome, setup is straightforward using the Ring app on a smartphone or tablet. You can activate a live stream at any time through the app, but it’s the motion-activated smart alerts that are the main draw. You can set motion zones, filter alerts by size of object or just people, the time of day or day of the week. You can also configure whether to trigger the floodlights, and there’s a loud siren built into it for good measure. Not that the foxes invading my back garden paid any attention to either. The camera is weatherproof and comes with two-year theft protection, in case someone is brazen enough to unscrew it from your wall. The lights can be turned on manually too. The camera records up to 1080p video and has a wide 270-degree field of view, digital zoom and night vision, and you can talk through the camera via the app. You get live view and alerts for free, but cloud recording costs £2.50 a month for 60 days of event recording. Verdict: The Ring Floodlight Cam has bright lights, a good superwide-angle camera and a siren making for a good deterrent, but wiring it in requires a bit more than DIY. The smartest camera here is also one of the most expensive. Google’s Nest Cam IQ is a wired camera available in both indoor and outdoor variants. Both versions need plugging into the mains, which limits where you can put them compared to battery-powered products. But it also means you get the best-in-class camera, which captures up to 1080p video in HDR, a good 130-degree field-of-view and night vision. 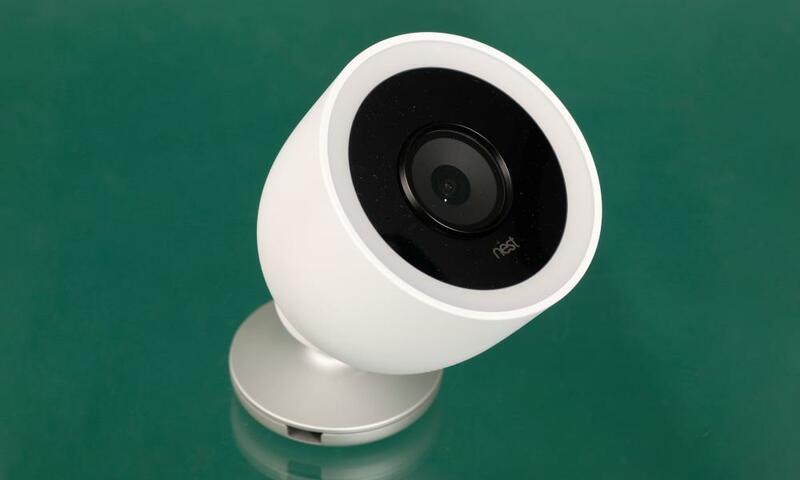 The indoor Nest Cam IQ is a relatively attractive lollipop-style camera with wifi built in, which can be wall or ceiling mounted, but most will probably just put it on a bookshelf or something similar. The outdoor version is shaped like a large spotlight and is screwed into the wall on a rotating, angled bracket. An indoor plug comes with it, meant to be threaded through the wall into the back of the camera, but a weatherproof alternative is available to buy for £49 if needed. Without a Nest Aware subscription you get live video feeds, motion alerts and three hours of image snapshots of events in the Nest app on your smartphone or tablet. Things get a lot smarter with a £4 per month 5-day Nest Aware subscription, adding continuous cloud recording, not just motion events, which makes it the best here for capturing everything that happens indoors or outside. You also get smarter detection of events, activity zones, clips and time lapses in the app, brilliant motion gif alerts, and face recognition. By tagging faces with names as they’re detected you can get the camera to recognise whether a friend or family member has shown up rather than a stranger. It worked well after undergoing a bit of training to spot that me with glasses on, me with a hat and me buckling under the weight of Christmas shopping were all the same person. You can talk through the camera via the app, or even access Google Assistant by saying “Hey, Google” to the indoor version of the camera like one of Google’s smart speakers. Verdict: It’s expensive, but if you need high-quality continuous monitoring, the Nest Cam IQ is the smartest of smart cameras. The Logitech Circle 2 series of cameras that start at £169 for wired, or £199 for battery-powered, prove that feature packed flexibility needn’t be complicated. 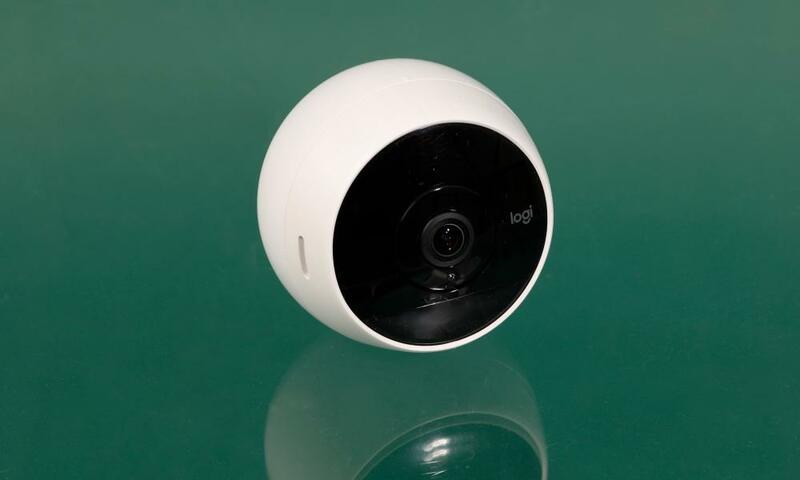 The little globe-shaped camera is simple to set up and use. Open the Logitech Circle app on your phone, connect the camera to wifi, place the camera somewhere and you’re good to go – no need for another box or subscription. You get 24 hours of cloud storage with video downloads and smart alerts free, plus a good 30-second summary of the day’s action in the app. If you want more it’s £2.99 a month for 14-day cloud storage. The Circle 2 is flexible too. Being weatherproof, it can be used indoors or out, has night vision, a 180-degree field of view and streams up to 1080p video. The camera bit unscrews from the back making swapping between mains and battery easy, while a variety of mounts mean you can stick it just about anywhere, including on the inside of a window looking out. It even proved durable enough to survive a couple of falls from my bannister, knocked off in the bluster of Christmas preparations. The battery lasts around a month when placed in a hallway, or longer if there are fewer events to record, and you can talk through it to whoever comes calling using the app on your smartphone. Verdict: The Logitech Circle 2 is simple, flexible and adaptable, making it great for those who don’t want to mess around with more advanced and costly systems. 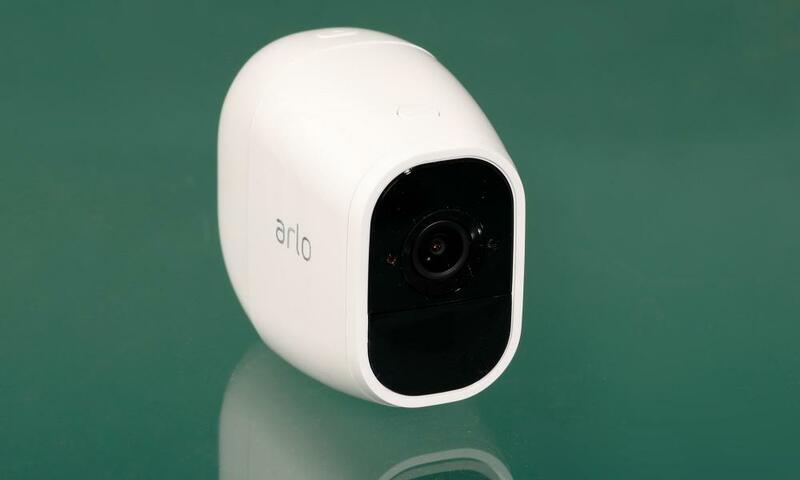 The Arlo Pro 2 consists of a battery-powered camera, which can also be plugged in, and a base station with a siren and local recording capability that connects to your router via ethernet. At first the requirement for a base station was irritating, but I quickly found out that the ear-splitting siren makes for a much better alarm system. The cameras are small and weatherproof and can be stuck just about anywhere, with various mounts available. What they can do depends if they’re on battery power or not. Plugged in, they offer up to three activity zones capturing a rolling three seconds before any event, sound detection and continuous recording. On battery power you’re limited to motion-triggered recording and alerts, but the battery lasts around two months in medium-activity zones such as a hallway or much longer in a backyard alley. The cameras capture up to 1080p video with a 130-degree field of view and night vision. You also get three seven-day cloud event recordings for up to five cameras. Paying £6.49 takes that up to 30 days and 10 cameras, while £6.99 a month per camera will record video 24/7 for 14 days. The Arlo app is not quite as good as the Ring or Nest app, but still gets the basics right, handling setup fairly easily, alerts and live streams. Verdict: They aren’t cheap, but if you need compact cameras all over your house and garden, even in awkward positions, then the Arlo Pro 2 is for you.